Glamoursplash: B.V.D. Not Just Undies but Swimwear Too! Yes, B.V.D. 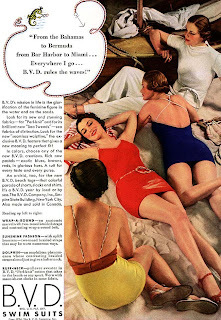 produced swimwear. Perhaps you know them better as maker of underwear for men, but they started in the business in 1876 and created undies not only for men but women too. B.V.D. was located in the Empire State Building in New York, and also manufactured and sold in Canada. 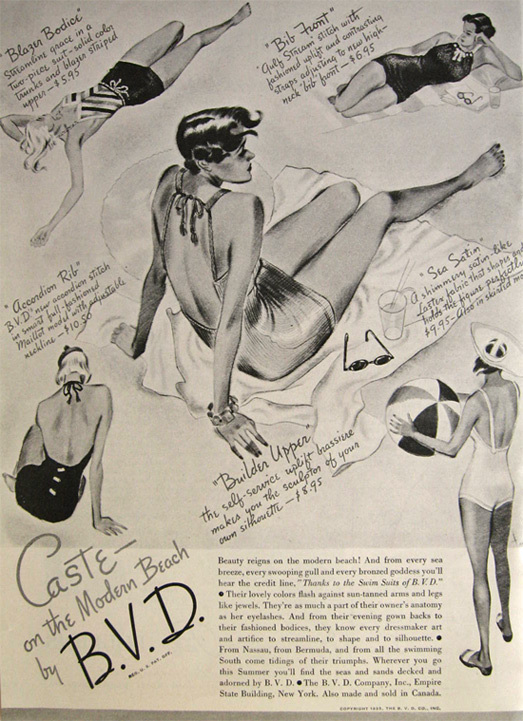 These ads from 1934 and 1935 shows a sampling of their swimwear. In 1929 B.V.D hired Olympic swimmer Johnny Weissmuller to model and represent the company at swimshows throughout the country wearing B.V.D swimwear.